In this section we will analyse the best and worst war bases to use in defending against the mass dragon attack at the TH8 level. 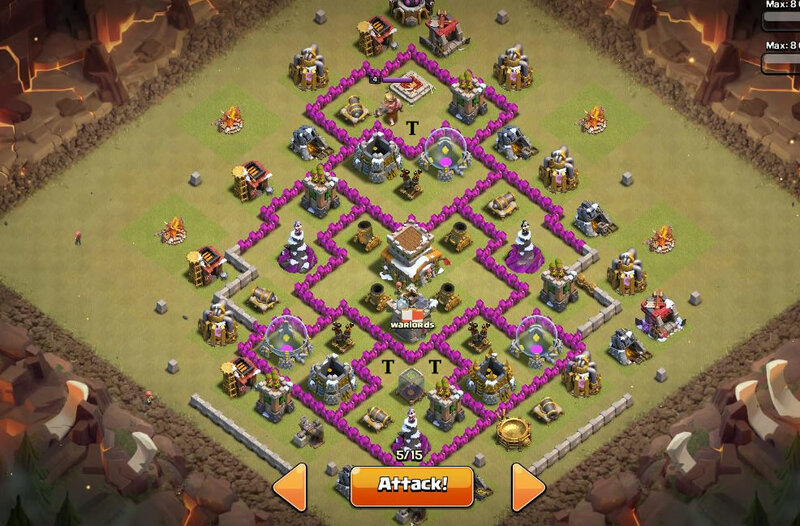 A consideration of TH7 bases will be omitted, since level 1 dragons can trivially 3-star any TH7 base. As we will argue below, the answer on what base is best to use is situational; some bases will perform well vs weaker player and very poorly vs stronger players, which means that the best base to use in war will depend on the skill level of the clan one is in. Additionally, we will also argue that the easiest bases to dragon will be the hardest to hog, and vice versa; anti-hog/anti-dragon bases don’t exist at the TH8 level. In order to determine the best base designs to use in stopping the mass dragon attack, we first give a deeper examination of the strengths and weaknesses of this attack. The biggest mistake that practically all players make when designing bases is that they are made to be pretty looking, which usually means symmetrical. While these bases may ‘look good’, they are almost always very predictable in terms of trap placement, which is not a good aspect for a war base to have (it should never be obvious to an attacker where the traps are located). Beyond this, symmetrical war bases also carry an air of familiarity to them, which is especially true of any of the most common bases found on forums and through a quick Google search. This is again a very bad aspect of base design, since an attacker has a huge edge when having previously faced similar bases (or worse, the exact same base). Therefore, strong bases should not be forced to have symmetry, and should all be as original as possible in design. To help argue why an unfamiliar, unsymmetrical (sloppy-looking) base should be used in wars, consider the following upload by JTJ U: THIS IS SPARTA! 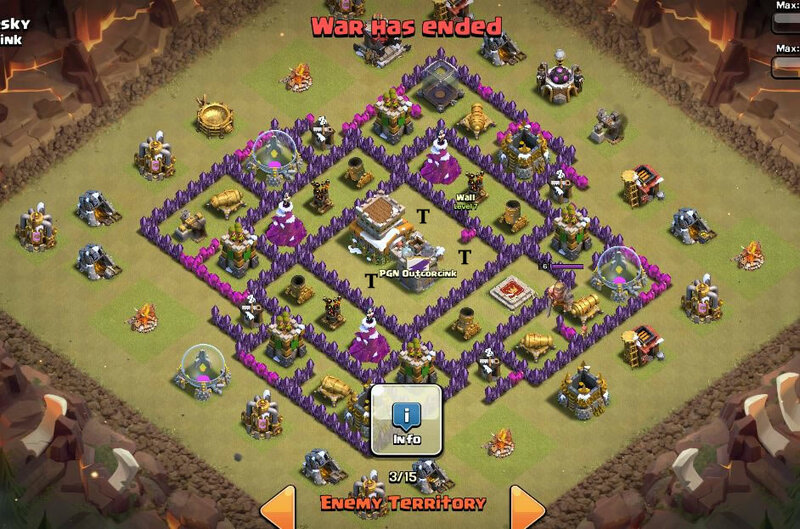 — TH8 — Best Base from war w/ “Zombie Chickens”. In this video, and to the surprise of the attackers, we see one dragon attack after another fail against this terrible looking base. At the end of the video, a few irrelevant reasons were given as to why this base held up so well, but the real reason for this was simply due to the fact that the attackers were thrown off from being unfamiliar with how to best approach the base. Now, we don’t necessarily advocate the use of this particular base ourselves, as any expert dragon attacker should easily expect to roll through this base using level 3 dragons (spread right and lightning on the left); the take away here is that the unfamiliarity achieved by such sloppy, ugly looking bases can be strong enough in their own right to befuddle a group of experienced dragon attackers. The goal of a TH8 anti-dragon base should aim to keep a strong attacker limited to a 2-star attack; we are protecting solely against the 3-star here. It is not possible to consistently stop a strong attacker from making 2-stars with mass dragons, so defensive aspects of the base should not be sacrificed by chasing hopes and dreams. Before getting into any of the specifics, we should specify that at minimum, a base should have three level 5 air defenses if it wishes to have a chance in stopping an expert level 2 dragon attacker, and need have maxed air defenses if it wishes to have a chance stopping an expert level 3 dragon attacker. Beyond this, the level of archer towers and teslas are also very important in defending against dragons, and should be maxed as soon as air defenses are finished; more on this below. As for clan castle troops, the somewhat-recent update that allows defending troops to exit the CC from all directions places an army of either all archers, or mostly archers with a couple of wizards, as the ideal anti-dragon clan castle army. 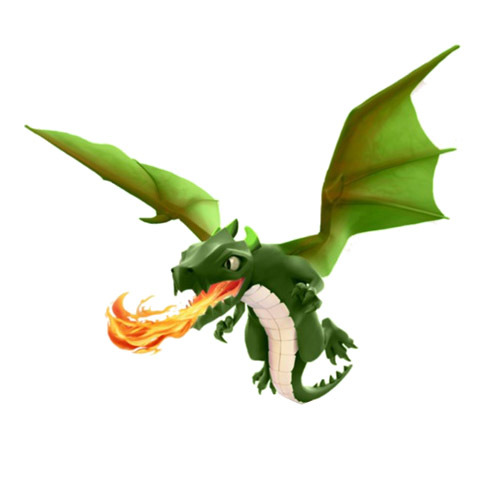 Dark Spells Update: A CC dragon is going to be the stronger troop to donate now since the new poison spell will quickly wipe out a horde of archers/wizards/witches. Why Not A Dragon? The CC dragon was our preferred choice before the clan castle update, but it just doesn’t compare to a mass archer army anymore. The reason for this is because raged dragons knock out a CC dragon extremely fast, yet raged dragons take out scattered CC archers essentially no faster than non-raged dragons do. While the CC archers don’t do a ton of damage themselves, their strength is that for every second that the attacking dragons waste killing archers, the defending ADs gain an extra shot it wouldn’t have otherwise had. For this reason, the CC should generally be centralized among the ADs, unless one is going for a certain pulling effect with their base (more on this below). Also, as mentioned in the overview section, expert dragon attackers will generally not be using lightning spells on the archer army, so this is not a worry either. Why Not All Wizards? All wizards aren’t great because their attack speed is slower than a dragons attack speed. For this reason, dragons usually pop the first shot off, and the wizards are wiped out before inflicting much or any damage. While it is true that a cluster of wizards can wipe out an entire dragon army (or any army) from a weak attacker, this will not be the case against stronger attackers. Remember, the point of this guide is to thwart attacks from skilled attackers, not weaker ones. At most, a couple of wizards could be mixed in to the mass archer army. In this case, the wizards have a much greater chance of popping a few shots off, since the attacking dragons will be somewhat distracted by the defending archers. Note that level 5+ ADs do more damage than level 5 wizards do, so more defensive strength is gained by using archers to stall the attack than by using many wizards to directly engage the dragons. The first aspect that should be considered are the spells used in the attack style. Since the rage/heal attack offers a greater potential win-margin (when applicable) than do lightning spells, the strongest base to use against the expert player is one that does not encourage the use of these spells; in other words, the air defenses should be spread out. This immediately rules out all moat and clustered-core base designs as viable options against the expert attacker. The next order of business to handle is how to make a war base most-resistant to the use of lightning spells, while still discouraging the use of rage/heal as an alternative option. To meet this end, the air defenses need to be spread out, but not to the point of being easily exploitable through the use of CC loons/hogs. Furthermore, we have also observed that dragons struggle most vs compact bases that offer high defensive DPS throughout the base, yet also have many buildings with high hit points dispersed throughout to slow the dragon attack down. Note that while compact bases are best combated using the rage/heal spell combination, properly spread ADs will make that spell choice less optimal to use. Alternatively, we will show that spread out anti-hog bases fail to pack the punch required to shut down a strong dragon attack. Examples of each of these base types will be shown at the bottom of this section. Next, a strong anti-dragon base should also have a clear vision as to exactly how it plans to shut down the dragon attack. In this regard, there are two main ways that the mass dragon attack fails. The first is when the dragons sweep through all of the air defenses in the base, yet fail on cleanup. The second is when the dragons attempt to sweep through yet, fail to take out one of the air defenses along the way, allowing that AD to knock out most if not all of the remaining army. Bases that stop dragons on the clean-up phase are generally more well-rounded, but really need maxed archer towers/teslas in order to be effective. However, a base that baits an attack from a certain direction can also be used here, but is usually going to be more exploitable than the well-rounded base. Otherwise, bases that aim to knock out a wing of the dragon attack are generally more exploitable, but may otherwise offer an option when defensive upgrades are lacking. Each of these base strategies are discussed in turn below. Note that while the above attack was for 3-stars, only two dragons remained against a non-maxed base with non-ideal AD locations. At first glance, one might have expected a much larger army to have finished the attack. Otherwise, keep in mind that this base is also extremely vulnerable to a hog attack; we stress that a balance between anti-hog and anti-dragon must be stressed in any strong war base. As a quick disclaimer, we stress that none of the following bases are perfect, as each of them all come with their various flaws and vulnerabilities. They are presented below to simply demonstrate some of the base design elements that we have considered in this section of the guide. Well-Rounded Example: A stronger example of the well-rounded cleanup stopper is shown below. This base has its AD sufficiently spread to discourage the use of rage/heal. Note the deliberate lack of symmetry perfect here. Maxed tesla along with seekers in the core help shut down the dragon attack during cleanup; storages dispersed throughout also slow the attack down. In terms of attack options, be aware that CC loons require at minimum three moves to reach the top two AD, and four moves to reach the bottom AD, which makes the balloon snipe less effective here. The same goes for CC hogs, as the spring traps located in each of those wall gaps could also ruin the hog snipe. However, a potential vulnerability is found with the ATs located on the wall edge, as single balloons could be used to take them out during cleanup. Finally, the ambiguity in the central double bomb location is also discouraging for an all-out hog attack. Attack Baiting Example: This next base is a bit less well-rounded than the previous base, since it is designed to bait a dragon attack from the bottom corner (bases designed to bait an attack from a certain direction are generally exploitable). At first glance, an attack from the bottom with lightning dropped up top seems optimal. However, the strength in this base comes from the many storages, teslas, air-traps, and CC archer/wizards that pour out from the bottom of this base to protect the lower ADs. While a strong dragon attack will have enough power to take out both lower ADs, the push will run out of steam before it reaches 3-stars at the top. Note that at minimum, a CC balloon snipe requires three moves to reach either of the lower ADs. Additionally, the top most AD is protected from an easy balloon or hog snipe due to the tesla located directly above it. As with the previous base, the ambiguity in the central double bomb location helps to make hog attacks more difficult as well. The following base is designed to shutdown either the left- or right- wing of a dragon attack baited from the bottom, as it is very difficult to knockout all three ADs without missing one when sweeping up from below. Note that the slightly offset CC to the left will help pull a uniform attack line of dragons to the left, leaving the right-side of the attack slightly weaker (as shown in the techniques section). Additionally, the two unsymmetrical elixir storages located at the bottom/bottom-right will slow down and further weaken the right-hand side of a uniform attack line from the bottom. This effect could further be exaggerated by stacking all of the air-traps on the right-hand side, which would help knock out any dragons that strayed to the right from a bottom attack line. Keep in mind that doing so would also make the base more exploitable as well. 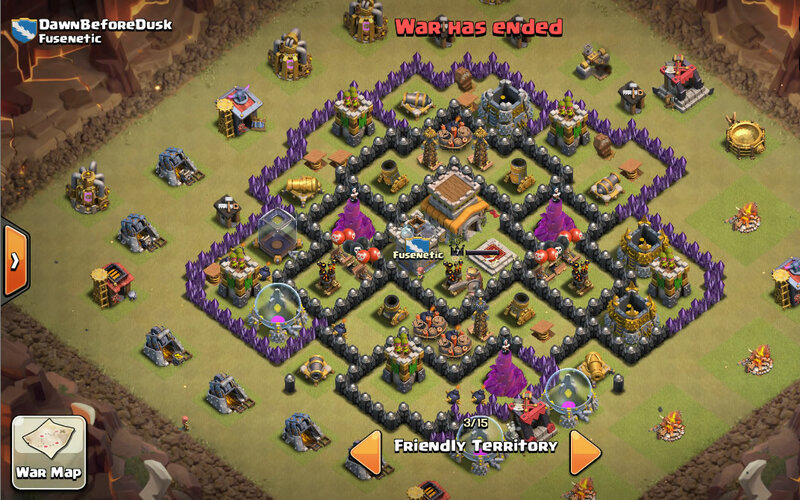 In terms of weaknesses, this base is more vulnerable to hog and balloon snipes than the previous two bases were. Additionally, the top most ATs are also a bit vulnerable to balloon snipes during cleanup, but the air skeletons placed up there should help in defending against that tactic. The side ADs are also vulnerable to CC balloon and hog snipes, so one might consider moving the cannons down to better protect against these tactics. Examples of some common weak anti-dragon bases are shown on the following section.